"We have nearly 1,000 active queries created with NGS-IQ to meet the reporting needs of our Lab, Case Management, Rediology, Pharmacy, Admitting, Medical Records, Rapid Response Team, Nursing Units, Finance, and more." 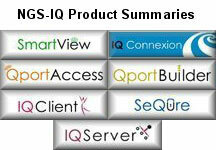 "I don't believe there's a department here that doesn't depend on an NGS-IQ report. It's an integral piece of our daily functions." "NGS-IQ allows us to quickly respond - without IT involvement - to requests from managers, vendors, state government, and regulatory agencies."